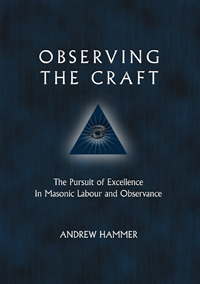 I read Andrew Hammer's Observing the Craft a few months ago. I have held off writing a review because I am still writing down my impressions. Of course, I should say that I'm nearly done with one to present to my lodge for the Masonic Light program. Instead of writing about my impressions of his book, I would like to open up this post to all of you. Here are some starter questions to help you. What did you think of the book? What do you agree with? What do you disagree with? Leave your impressions and observations as a comment below. If you haven't read the book, buy it now. I found it on the Observing the Craft website.